﻿ How to Play FLAC Audio in Car Stereo or Car Radio? Home » audio » How to Play FLAC in Car Stereo or Radio Using a USB Drive? How to Play FLAC in Car Stereo or Radio Using a USB Drive? Though many car stereos enable to play audio files from USB flash, few of them can play FLAC audio. For using USB means the audio is decoded by the headunit digital signal. However, car audio manufacturers often ignore this FLAC codec completely and there isn't a single headunit that supports FLAC (Kenwood music keg and some other addons are exceptions). Is there no way for car stereo to playback FLAC files from USB flash drive? Surely not! The following article will introduce a recommended solution: Convert FLAC files to car stereo or car radio supported audio format. 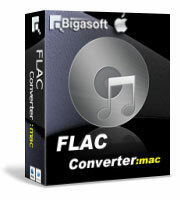 Bigasoft FLAC Converter is just the right FLAC in Car Converter! It can fast convert FLAC audio to car radio/stereo supported WAV format with the highest quality output. It also can convert FLAC to car stereo compatible MP3, WMA, AAC with much smaller output file size. Besides converting FLAC for car stereo and car radio, it also help to convert other audio formats including CAF, QCP, M4B, M4A, RA, SHN, AMR, VOC, PCM, MPC, AC3, AIFF, APE and etc for easy playback on car stereo. The following is a step by step guide on how to convert FLAC files to car stereo supported format for successfully playback FLAC on car stereo, car radio or home stereo and etc. Free download the powerful FLAC Car Radio/Stereo Converter (Mac Version, Windows Version), install and run it. Click the "Add File" to add the FLAC audio which you want to play on car stereo to Bigasoft FLAC Converter. This powerful FLAC Car Stereo Converter also supports drag and drop function. Click the "Profile" drop-down arrow to select the desired output audio format from the "General Audio" category according to the specific supported formats of your car stereo. Usually, the car stereo or car radio supports to play MP3, WMA, AAC, and WAV from USB drive. Choosing WAV as output format will achieve converting FLAC with almost no loss of audio quality. Choosing MP3 or WMA as output audio format may result in some change in audio quality but with smaller audio file size. 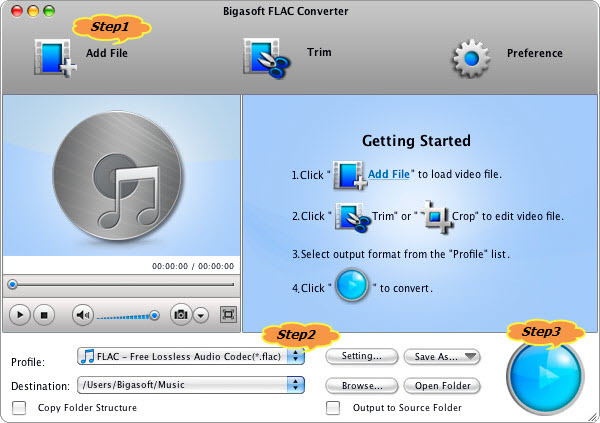 Click the "Convert" button to start converting FLAC to car stereo supported audio format, it will be finished with the highest quality output and super fast conversion speed. After finishing the FLAC car stereo audio format conversion according to the above step by step guide, simply play the converted FLAC audio files using USB drive in your car stereo or radio.